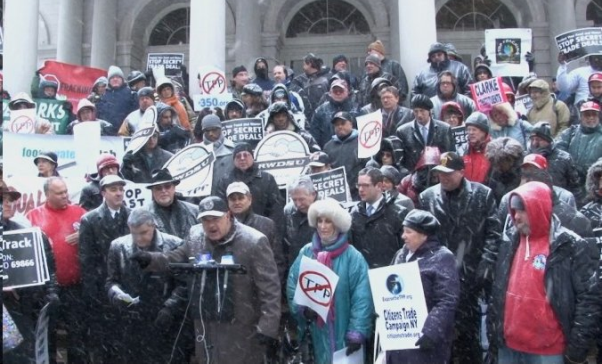 IAM District 15 Business Representative Jim Conigliaro, Sr., flanked by dozens of union supporters at a rally in New York, demands Congress votes “No” on a bill to reauthorize “fast track” authority on the Trans-Pacific Partnership (TPP) trade agreement. IAM Directing Business Representative Jim Conigliaro, Sr., of District 15 in New York, joined fellow New York labor leaders and local state Congressmen in a blistering snowstorm as they rallied against the recent introduction of “fast track” legislation in the U.S. Congress. The bill calls for the reauthorization of trade promotion authority (TPA), or “fast track” Congressional consideration, of free trade agreements. Passage of the bill is needed in order for supporters of the Trans-Pacific Partnership (TPP) trade agreement to ram the unfair, anti-worker, seriously flawed trade deal through Congress. If “fast track” authority is granted, Congress has no say over TPP, cannot offer amendments, and can only cast an up or down vote. The political maneuver has been used in the past to pass such failed trade deals as the North American Free Trade Agreement (NAFTA). TPP is a trade deal currently being secretly negotiated among 12 countries in Asia and Latin America, including the United States. To date, all access to those negotiations and copies of the agreement’s draft language have been denied – except to U.S. trade negotiators and deep-pocketed corporations. The egregious trade deal is said to be the biggest trade deal mistake since NAFTA. Take action today. Click here to tell Congress we want fair trade, not free trade. Pictures of the rally are available here.